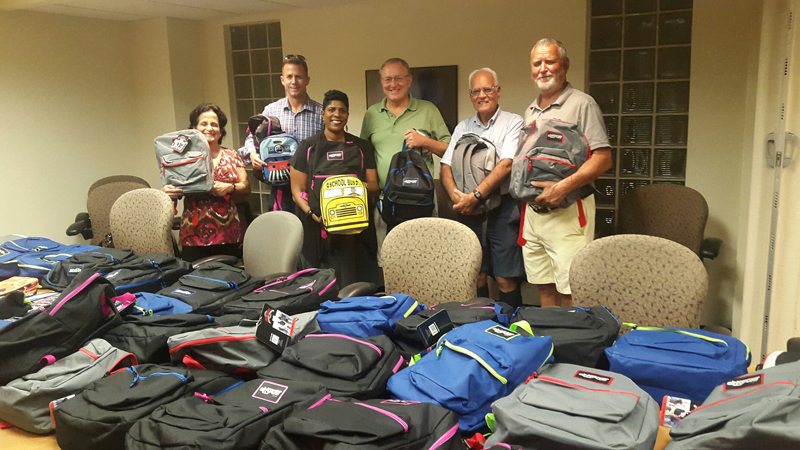 As part of the community wide effort to make sure that Bermuda’s children go back to school with everything they need, the Pembroke Rotary Club [PRC] donated 60 backpacks filled with school supplies to the Foster Care Section of the Department of Child and Family Services [DCFS]. The Club worked with the Department of Child and Family Services to verify the number of Bermudian children who are in foster care and who have a need for back to school supplies. The children are at all school levels – Pre-School, Primary, Middle and Secondary school – and the backpacks contain supplies including binders, notebook paper, rulers, pens and pencils, a water bottle, granola bars, dental care products as well as other age appropriate products. Sony Kessaram [PRC], Jason Taylor, President of PRC, Selena Simons [DCFS], John Bauman [PRC], John Kessaram [PRC], and Bob Flath [PRC]. Pembroke Rotary Club said they would like to thank Butterfield and Vallis, AF Smith, the Phoenix Stores, and BGA for donating supplies or providing the Club with discounts on the purchase of supplies. Jason Taylor, President of the Pembroke Rotary Club, presented the backpacks and supplies on behalf of the Club and expressed his hope that the donation would make the first day of school just a little bit brighter for foster students. Mr Taylor invited anyone who might be interested in working with the Club on community projects such as this to come to a PRC breakfast meeting. Meetings are held at the Bermuda Yacht Club each Thursday from 7:30 am to 8:30 am and the Club would welcome anyone who wants to become involved with Rotary. Ms. Selena Simons, the Foster Care Coordinator for DCFS accepted the backpacks on behalf of the children and their foster parents. Ms. Simons thanked the Club for again contributing to Bermuda’s foster children and assured members that the backpacks and the supplies would make the process of getting ready to go back to school easier for everyone.